Men have been stabbing, cutting and slashing each other for thousands of years. In fact, it’s believed that the first swords started to appear some 3,700 years ago. That is, as soon as man learned how to shape metal, he has been using that knowledge to kill. Over the centuries, swords became increasingly sophisticated – and increasingly deadly. Often, the design was adapted to counter advances in defenses, in particular the type of shield a soldier might carry on the field of battle or the style of armor he would wear. At some points in history, stabbing swords were in style. At other times, weapons better-suited to slash and cut were in fashion. And, of course, the style and design of swords was different the world over, even if their general purpose was the same – to maim and kill as efficiently as possible. The Roman gladius was a simple but brutally effective thrusting weapon. Pinterest. According to the ancient historians Livy and Polybius, the gladius wasn’t a Roman invention. Rather, the Roman Army decided to copy the swords used by the Celt mercenaries who fought for Hannibal.. Swordsmiths would fuse together stripes of low-carbon steel to produce the blade, with a channel down the middle to add to the strength. The grip was only big enough for one hand, and sometimes an ornate hilt or even an engraving was included. It’s believed that the normal soldiers wore their gladii on one side, while their centurion wore it on the other to set him apart. Though it could cut off an enemy’s limbs if it was sharp enough, the Roman gladius was largely a thrusting weapon. At the start of a battle, Rome’s soldiers would throw their pointed javelins at their enemies. Only then would they advance. Once close enough, they would swing their shields and then try and stab an opponent with their gladius. 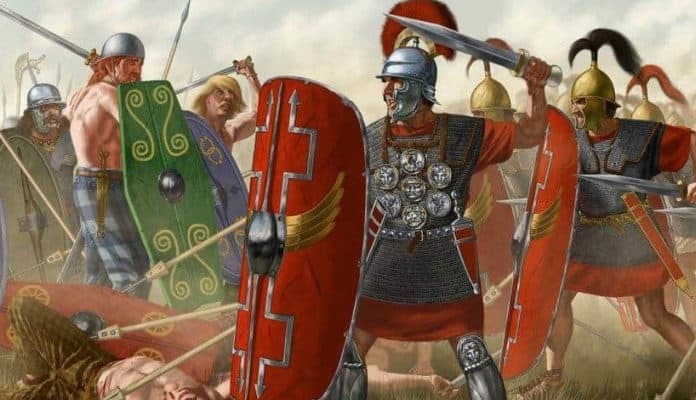 Due to a lack of battlefield medicine, a simple stab in the abdomen almost always proved to be fatal, though Rome’s soldiers weren’t above striking a low blow by swinging their gladii beneath their enemies’ shields and taking out their knees.